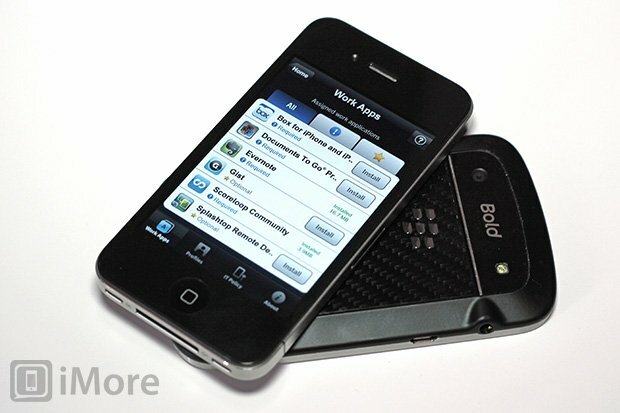 BlackBerry-maker Research In Motion (RIM) today launched their first iPhone app. No, unfortunately it's not BBM for iPhone. It's a BlackBerry Mobile Fusion client and, while not flashy, it marks their foray into cross-platform enterprise device management. After installing the BlackBerry Mobile Fusion Client on an iPhone, your company's IT administrator will be able to roll out company-approved apps, handle device configuration, remotely lock or wipe devices, and set policies for device usage by group or individual. Of course, from the admin side, the web-based Mobile Fusion console allows management of all sorts of phones: BlackBerry, as you'd expect, as well as Android devices. Say what you will about RIM's dwindling market share (even in the business space), this is a smart move on their part. They're realizing BlackBerry isn't the king of the castle anymore, but they're still playing to their established strengths. Of course, that's no guarantee for success; RIM is going to need to do a better job of iPhone enterprise management as a third party than Apple is able to with their own Configurator software. There's certainly an advantage in supporting all of the major platforms, and considering their partnership with Bing, it wouldn't be surprising to see RIM include Windows Phone support once demand for Microsoft's mobile platform rises. Regardless, BlackBerry will always get the top treatment in Mobile Fusion, and businesses that run predominately on another platform may prefer a solution that's equivalently specialized. In any case, I can only imagine the smirk on the face of the Apple employee that got to approve Mobile Fusion for the App Store. Any votes for BBM on iOS next? Any administrators in the house interested in trying this out will be able to sign up for 60-day trial, after which it costs $99 per user for licenses, or $4 per month per user.